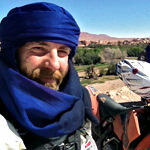 Gary Inman is a British motorcycle journalist, publisher and author. He has contributed to leading magazines (and websites) in five continents and currently has columns on motorcycling in Rolling Stone Italy and Café Racer France. Gary is also the co-founder of Sideburn magazine, launched in 2008. He contributed to The Ride and has also written a book profiling 30 contemporary artists, Motorcycle Graphics (published by Korero Books). With no formal training in journalism, his big break came writing about the huge and diverse British scooter scene for Scootering in the early-90s when he was an engineering apprentice. Conducting motorcycle road tests for local papers followed, before landing his first full-time journalism job at Streetfighters in 1995. He’s been writing about all aspects of motorcycling since. Gary has wrestled a Benelli TnT through the Mauritanian Sahara, ridden at Bonneville, raced a Kawasaki Z1000 and crashed on the launch of the original Yamaha R6 at Phillip Island. He is in his eighth season of flat track racing and has recently built a radical 1216cc Suzuki GSX-R road bike in a custom frame.